Tides Change: Public awareness about water scarcity drives irrigation pump trends. Pump station trends reflect a need to manage water efficiently and monitor results. Pump stations—often referred to as the hardest-working components of an irrigation system—are designed to pressurize water from supply sources such as ponds, wells, lakes, ravines and storage tanks and direct it to irrigation systems on residential, commercial and agricultural properties. Often working hand-in-hand with irrigation controllers, pump stations help ensure the right amount of water is applied at the right time to maintain healthy turf. With the public recognizing that water is a valuable, limited resource in many parts of the country, some say pump stations are more important than ever and are being designed to manage water as efficiently as possible. Industry experts agree this move toward sustainable water management has driven recent pump station trends. The popularity of rain water harvesting in residential and commercial markets and stringent regulations surrounding stormwater management has increased the use of pump stations for irrigation, says Bill Tullos, district sales manager for SiteOne Landscape Supply in Orlando, Fla.
Kevin Johnson, director of national sales for Munro, a manufacturer of pumps, pump stations, pump controls and pump accessories based Grand Junction, Colo., says the increased use of reclaimed water has resulted in pump stations with better filtration capabilities. Water use restrictions often require landscape watering to be completed in a very short period of time and only on specific days. Beard says pump stations are needed to meet the irrigation demand while complying with regulations. Pump stations are being used for water capture and reuse more than ever before, says Kevin Johnson, director of national sales for Munro. 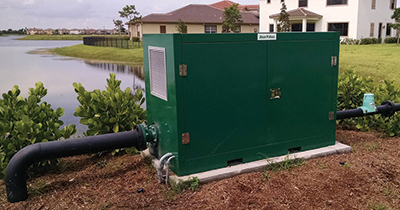 Whether using city water or reclaimed water, by introducing dedicated pumping stations to residential neighborhoods, it’s easier to maximize the potential of these “watering windows” that have been established by local public water management agencies. In many cases, he adds, water regulations and communities’ desires to use reclaimed water sources for irrigation have led to more centralized systems in residential neighborhoods. For example, instead of relying solely on the same city water lines that bring drinking water to homes, more homeowners’ associations are using retention ponds and dedicated pumping stations to provide irrigation water to individual homes. “As residential and commercial developments extend farther away from municipal water sources, the pressure needed for a properly functioning irrigation system may no longer be available straight from the tap,” Beard says. Also changing are variable frequency drives (VFD), which are used when flow demand varies at constant pressure. VFD manufacturers offer simpler, lower cost drives with fewer bells and whistles, causing VFD prices to decrease. On stations with multiple pumps, it’s becoming common to have a VFD per pump. Pump stations with VFDs used to be 5 hp and larger, but now smaller stations use VFDs with 2- or 3-hp motors, Johnson says. Alan Garcia, president and owner of Fort Worth Lawn Sprinkler Co. in Fort Worth, Texas, says VFD improvements have had the biggest impact on his use of pump stations. Fort Worth Lawn Sprinkler Co. uses pump stations about 2-3 percent of the time to irrigate landscaping with water that’s not pressurized. 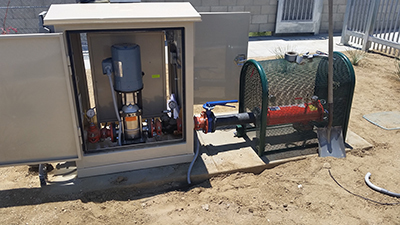 The company commonly installs and maintains single-pump stations on residential properties with lakes, ponds or water storage tanks to help clients save money on their water bills. Johnson says many contractors look for pump station components to be listed by UL, a global independent company that publishes nationally recognized safety standards. He says they also should look for the manufacturer to be an UL-listed panel shop and for the pump station to have a QCZJ UL listing, indicating the pump station is UL listed as a packaged pumping system. Contractors also should promote their use of high-efficiency motors on pump systems, Tullos adds, which are now required by the Environmental Protection Agency. Convenient and user-friendly monitoring of pump stations is another trend. Contractors and end users are looking to monitor the pump station via web apps, and Johnson says his company is seeing more requests to get water use data reports from the pump stations. Irrigation consultants and contractors also want to be able to look at the entire irrigation system, including the pump station, as a package, so there are more efforts to integrate the pump station with the irrigation control system. Bryan Gribskov, owner and manager of Cascade Pump & Irrigation Service in Bend, Ore., says manufacturers are also introducing stations with more efficient pump assemblies and motor manufacturers are following suit. Gribskov’s company uses pump stations about 95 percent of the time working with a 75 percent agricultural, 25 percent commercial clientele. He says he would like to see more development of packaged pump stations that come on a skid, wired to a control panel and are ready to go. Contractors should recognize that, as irrigation systems become more complex, it’s important to work with a supplier who understands and supports the entire system. Contractors should consider a vendor who can provide everything needed to complete a project. Gribskov says contractors should work with a reputable supplier to learn the pump station basics. He says about 45 percent of Cascade’s jobs are rebuilding pump stations improperly installed the first time around.